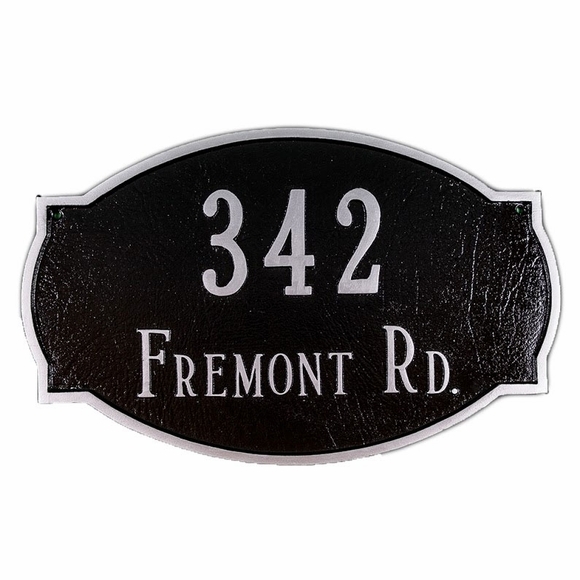 House Number Sign - - personalized oval address plate stands out from the crowd with the addition of four pointed corners. Comes in three sizes from 10" wide to 26" wide. Wall mount or lawn mount (with the additional 24" lawn stakes that you can order with your sign). Made in USA. Small size is a one-line sign and holds up to five (5) 3" numbers. Dimensions: 10.25"W x 6"H.
Standard size can be set up as a one-line or two-line sign. On a one-line sign, Line 1 holds up to five (5) 4.5" numbers. On a two-line sign, Line 1 holds five (5) 3" numbers and Line 2 holds up to seventeen (17) characters. Dimensions: 15. 5"W x 9.75"H.
Estate size can also be set up as a one-line or two-line sign. On a one-line sign, Line 1 holds up to five (5) 8" numbers. On a two-line sign, Line 1 holds five (5) 4.5" numbers and Line 2 holds up to seventeen (17) 2" characters. Dimensions: 26.67"W x 16"H.
Hand cast in rust resistant aluminum metal. Coated with weather resistant paint. Lawn mount signs are made specifically for the matching 24" lawn stakes and have an integrated leg extension for attaching to the stakes. Small size comes with one stake. Standard and estate sizes come with two stakes. Personalized oval address plaque enhanced with distinctive pointed corners. Three sizes: small, standard, and estate. Made in USA. Wollmers sign photos (Estate size in color antique bronze/gold) were submitted by Grace Collier of Australia who writes "The minute we opened the packaging we were thrilled. It is well made, and of great quality materials. It was better than anticipated."